Can Birds Be Kept in a Greenhouse? With its lush greenery and temperate climate year-round, greenhouses are beneficial environments for plants, but you might consider adding an animal to the ecosystem. If you've ever thought a few birds would be a pleasant addition to the atmosphere of your greenhouse, go ahead and put them inside. The climate is just right for a number of different birds, and keeping them in a greenhouse will enhance more than the ambiance. Many different birds would enjoy having a home in your greenhouse. It might cheer you to hear the twitters, chirps and squawks of birds while you're working with your plants, but birds can be useful for the environment in your greenhouse. They'll help control the pest population by eating bugs and spiders who try to set up house in your plant conservatory. They'll assist with balancing the atmosphere, too, by breathing in excess oxygen. Not all types are suited to greenhouse living, although there are a number of birds you can keep in a greenhouse. Before setting any birds free inside, make sure they are ones who will do well in the humidity level and temperature range of your greenhouse. 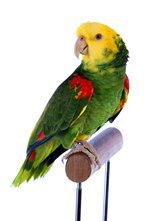 Parrots of all sizes, from parakeets to conures and macaws can typically live happily in a greenhouse. Finches and canaries are smaller birds who would thrive if kept in a greenhouse, as well as hummingbirds. You even can keep chickens in a greenhouse during the winter to provide them with a comfortable climate. If you've decided that birds are just what your greenhouse needs, your next question is whether to let them roam free among the plants, or if they should be caged. If you're housing chickens, you'll probably want to construct a pen at one end of the greenhouse to keep them out of the vegetables you're growing. Parrots, who are notorious nibblers, should be kept in large cages, but you can allow them out when you're present to supervise their activities and keep them from gnawing your plants to nubs. The smaller birds, such as the finches, can be allowed to fly free inside your greenhouse. When you keep birds in your greenhouse, there are a few issues you should consider. 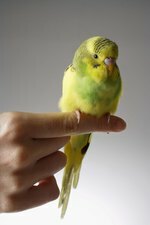 If you're letting your birds fly free inside, you should place screens over the entrances and windows that open to keep them from escaping. Also, you'll have to forego chemical gardening substances such as fertilizers, fungicides, bactericides, mineral retardants and pesticides. All will be toxic to your birds and will poison their atmosphere. Set up the feeders for free-flying birds so that they're over the pathways inside your greenhouse. You don't want seed to spill into your plants as it will sprout and result in a snarl of unwanted weeds.